Let’s review the latest outrage from a Governor who smells defeat at the polls tomorrow: lay off 5,000 state employees, cut $5.4 billion from school spending and borrow $7.5 billion from local governments (as if they didn’t have their own share of fiscal problems.) He even wants to lease more sites for off-shore oil drilling to bring in $100 million, even though the state doesn’t have an oil severance tax. No longer content to using scare tactics to get voters to approve his ballot measures, Arnold has said these steps will be necessary even if all Propositions pass – as the deficit now stands at fifteen billion dollars. So why are we currently in this mess? The short answer is we’re in a bad recession with 11.5% unemployment, and the bottom has fallen out on the state’s revenue. Even the SF Chronicle agrees that laying off state workers is not the way to deal with this sudden and sobering deficit, and would probably make the problem worse. But the long answer is that – through a deadly combination of tax cuts and borrowing money to avoid any tax increases, Governor Arnold Schwarzenegger dug the state into this hole. 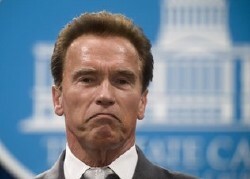 In 2003, Schwarzenegger followed up on his campaign pledge to cut the Vehicle License Fee – the so-called “car tax” that had been around since 1935. That step alone blew an annual $6.5 billion hole in the budget, which to date has added up to $35 billion. The Governor went on to walk the next five years in lockstep with the legislature’s Republicans, refusing to support any tax increase whatsoever. It wasn’t until last August that he finally acknowledged a revenue problem, but the only tax he would hike at the time was the sales tax – which adversely affects poor people, and is probably the worst tax to raise when the state is in recession. But it’s not just a stubborn refusal to support new revenue. Arnold has compounded the problem by borrowing money – which, of course, the state eventually has to pay back with interest. In March 2004, when we had $15 billion deficit and the Governor was popular, Arnold persuaded the voters to pass Proposition 57 – a $15 billion bond to pay off that year’s budget gap. Like the current debate over the May 19th propositions, the argument was that defeat would make awful cuts necessary. Borrowing money is not always a bad thing, if it goes towards permanent infrastructure – like housing, schools or hospitals. But Prop 57 was like using a credit card to buy groceries – not a smart idea! Now, Proposition 1C would allow the state to borrow up to $5 billion in future lottery revenue – which literally means we would be “gambling on gambling.” It’s an idea that Schwarzenegger has pushed for years, and the only reason many Democrats are voting “yes” is because it’s the only May 19th measure whose defeat would have a major short-term downside. But now Arnold has outdone himself when it comes to pushing fiscally irresponsible tactics – he wants the state to borrow $7.5 billion from county governments (even though they’re broke), just to balance this year’s budget. As a “post-partisan” Republican who the media fawns over, Schwarzenegger could have used his bully pulpit to bring fiscal sanity to the state. He could have pushed a modest raise in the income tax for the rich, which Republican Governors like Ronald Reagan and Pete Wilson did when the state hit hard times. He could have pushed an oil severance tax, so that California would not be the only oil-producing state to avoid getting its fair share from oil exploration. And most of all, he could have pushed a repeal of the “two-thirds” rule that lets a minority of legislators hold the state budget hostage every year. Instead, Arnold passed up every such opportunity to do the right thing. When Democrats in the legislature pushed a majority-vote budget in December as an end-run around the “two-thirds rule,” he vetoed it because it didn’t allow enough state privatization. With the May 19th propositions headed to defeat, Democratic leaders plan to re-introduce this proposal. Will the Governor join them, or will he pursue more bad sequels to his Hollywood gimmicks that fail to materialize?